Northern Illinois University College of Law alumnus Vincent F. Cornelius (’89) was elected third vice president of the Illinois State Bar Association (ISBA). Cornelius is now in succession to become the first African-American president of the ISBA in its 136-year history. In 2016, he will lead the largest bar organization in the state with 32,000 members. “The Illinois State Bar Association is among the premier bar associations in our nation. I am so blessed and thankful to be elected to the line of succession that will eventually allow me the honor of leading our association as president. I am elated, humbled and looking forward to the task ahead,” Cornelius said. Cornelius is the principal of The Law Offices of Vincent F. Cornelius, with offices in Wheaton and Joliet, where he concentrates in civil and criminal litigation. He has been a member of the ISBA his entire legal career, and was first elected to the Board of Governors in 1999 as a downstate Under Age 37 member. He has served as a member of the Governor’s Commission on Criminal Law Reform and as chancellor of the ISBA’s Academy of Illinois Lawyers. 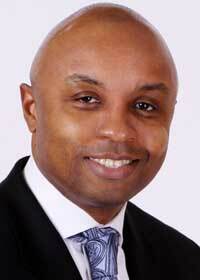 He also made history in 2008 when he became the first African-American president of the Illinois Bar Foundation. In June 2011, he was appointed as an at-large member of the ISBA Board of Governors to provide leadership opportunities for under-represented segments of the association and its governance. Cornelius is an active alumni member at NIU Law, where he has served on the NIU Law Alumni Council since 1998, contributed as a mentor to law students and is a frequent speaker on alumni panels. One of his greatest contributions to the College of Law has been hosting the NIU Law Minority Reception since 2004, an event that has become an annual tradition and favorite among alumni. He was honored in 2010 with the NIU Law Outstanding Alumni Award; and in 2005, he received the Outstanding Service Award from the NIU Law Alumni Council. Kenya A. Jenkins-Wright (’03), Julie A. Neubauer (’07), and Hon. John A. Wasilewski, ret. (’78) were elected to the ISBA Assembly for Cook County.